A crew of supersized exoskeletons ready to race? Well, a machine teased as such, as the machine, of startling proportions, drew attention at CES this week. This curiosity is nearly 15 feet tall, 18 feet wide, and weighs more than 8,000 pounds. At CES, Furrion presented its "exo-bionic" racing mech—-and it is now set for motion. As TechCrunch pointed out, "This isn't a robot. It's an exoskeleton that requires a driver." Shubham Sharma similarly in International Business Times stressed that "A human has to sit inside the exoskeleton to control and drive it... Specifically, the exoskeleton amplifies the motion of the driver. If the hands of the driver sitting inside are not moving in the right direction, the exoskeleton's movement won't be coordinated too." The point is that the driver becomes one with the machine. The company has dubbed it as Prosthetic, which makes sense based on what its creators want to do with it: make it race with a driver. Here is where athletics and sport competition come in, as Prosthesis is not easy to pilot. Digital Trends said, "The mech eschews computers, relying on the human pilot to move the limbs; as such, pilots will need to be athletic to keep the mech moving." Furrion co-founders Matt and Aaron Fidler were at CES and they talked to Digital Trends about their aspirations for racing. They have their vision set on mech racing as future sports, and they see it on the cards. Andrew Krok in CNET reported that Prosthesis is "the first mech in what its parent company hopes will become a racing series." 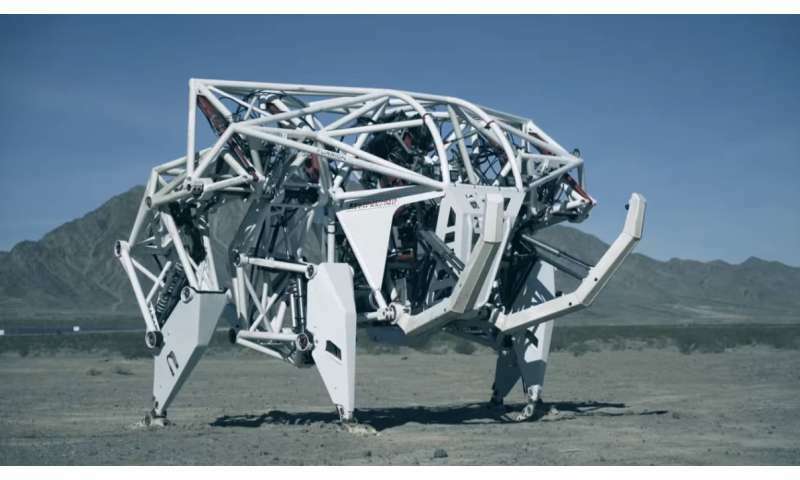 They have been thinking about this mech racing idea for a while, as last year Eric Limer in Popular Mechanics, said, "The future, as Furrion sees it, holds robotic races in which a handful of mechs such as these—designed with different modes of locomotion in mind, but all adhering to a basic set of rules to ensure fairness—would strike out across all kinds of terrain. It's an ambitious dream, to say the least, but giant robots are hot right now." Racing? The mech doesn't move too quickly, and it is designed to go around 20 mph. However, it is not a self-acting robot; it depends on the driver pushing the limits of human performance as well. "Movement comes from amplifying the pilot's motions. No joysticks here," CNET remarked. How did they come up with the idea? In the Digital Trends interview, they said the mech started with an inventor, Jonathan Tippett, who worked on something years ago. They saw his work and formed an alliance. Tippett, chief technology officer of Furrion Exo-Bionics, said, "Because no one has ever attempted this before, I don't think any of us realized the learning curve of getting an 8,000-pound machine to move as one with the pilot's body movements." Will Nicol in Digital Trends said Tuesday that the company is "going full-steam ahead with research into mechs." They spoke about the mech for use in racing. They told Digital Trends at the show that "the next step is to build a second mech or a third mech, and then within two years, hopefully, we launch the first X1 mech racing league." A video posted earlier this week introduced "X1 Mech Racing." Comments on several sites indicated viewers had hoped for speed racers, as in racing cars, and they poked fun at what they saw. "I'll wait for this thing to run 21 mph." Another comment was that "racing doesn't seem the most compelling sport for this." Materials used: The frame is made of chromoly steel. Short for "chromium-molybdenum," it is a high-performance alloy used in sports and aerospace. The company is focused on Prosthesis. It gets about 90 minutes of power, depending ono the terrain, from its batteries. The company release, meanwhile, said "Furrion will continue innovating with the creation of smaller and more agile mechs." The release also said their team will eventually produce "a model that athletes can purchase for mech racing." They said interest in mech racing was "huge." They never heard of 'Zoids' before? Zoids are a better idea than just racing.